Hand-over animation is the process by which hand animation is added to existing full-body motion. 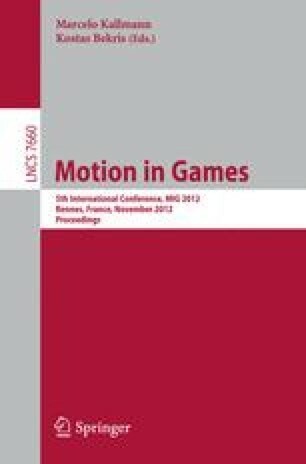 This paper proposes a technique for automatically synthesizing full-resolution, high quality free-hand motion based on the capture of a specific, select small number of markers. Starting from a large full-resolution hand motion corpus, our technique extracts a finite pose database and selects the marker sets offline, based on user-defined inputs. For synthesis, capture sequences that include this marker set drive a reconstruction process that results in a full-resolution of the hand through the aid of the pose database. This effort addresses two distinct issues, first how to objectively select which is the best marker set based on a fixed number of desired markers and, second, how to perform reconstruction from this data set automatically. Findings on both of these fronts are reported in this paper.